There are many different podcasts out there on the internet but it is my belief that ESPN consistently puts out the most well-produced and interesting sports podcasts that gives a different perspective than their radio and T.V. shows such as SportsCenter. My personal favorite out of their suite of podcasts is The B.S. 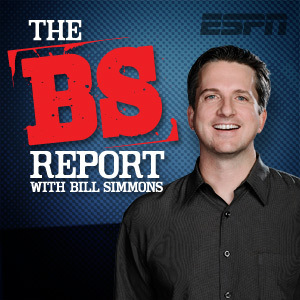 Report, featuring the sportswriter and journalist Bill Simmons. It is generally produced weekly covers all the sports of the weeks as well as going off-topic on ramblings on various celebrities, news in the world, movies, t.v. shows, and pop culture in general. Many times he has guests that recur on the show such as the clip I chose here with the comedian Cousin Sal. He has had other entertainers, athletes, sports writers, and personalities on the show in the past as well. There is no real structure to the show as te host tends to discuss subjects that he wants to which many times lead to him talking about his love and at times disgust for his Boston area teams. In the clip below he discusses the outcomes of the games on Sunday for the NFL as well as how he won his gambling bet with three tams. It gives you an idea of the kind of flavor he brings to the show. It isn’t just a dry radio host giving you information; he gives you an interesting and often times humorous view on the world of sports. His words can sometimes be controversial but he does not bite his tongue and says what’s on his mind which is why he has become so popular. I recommend this podcast for anyone who is interested in sports but gets tired with the boring ways that it has been covered by the media and are looking for something fresh. There is a reason why it is always near the top of the overall iTunes list for podcasts and now is as good a time as any to find out why.